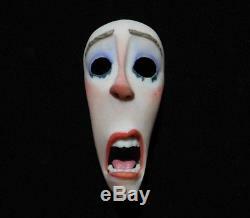 An original screen used'Movie Lady' face used in the hit film ParaNorman (2012). ParaNorman was release in August 2012 and was nominated for various awards. It was the first stop motion film to used a colour 3D printer to create the character faces, and the second stop motion movie to film in 3D. Measuring at approximately 3.14 long It is a beautifully presented piece and can be clearly seen in the screen shot provided. 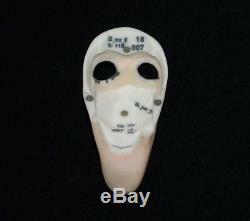 Made from a type if resin used in 3D printing, it is in an excellent condition. ParaNorman was produced by the renound Laika productions who were also resposible for such films as Coraline and Kubo and the Two String. The item "ParaNorman (2012) Screen Used Stop Motion Puppet'Movie Lady' Face + COA" is in sale since Sunday, October 7, 2018. This item is in the category "DVDs, Films & TV\Film Memorabilia\Props\Original". The seller is "studiopropsuk" and is located in Camborne. This item can be shipped worldwide.